Notes: Whitland station was opened by the South Wales Railway which became part of the GWR in 1862. There was also a separate Whitland station on the Pembroke & Tenby Railway which opened as a terminus on 5th September 1866. This was closed in August 1869 when trains were diverted into the GWR station. 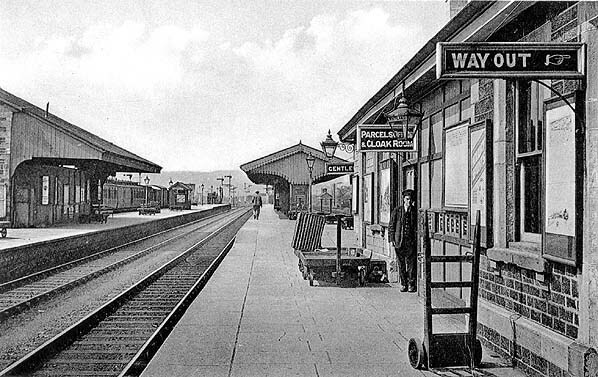 After the opening of the the Whitland & Taf Vale Railway (1874) the station had four platform faces. Two of these served the main line, one served a loop round the down island platform and the other a bay behind the up platform with access from the west. The main station buildings were on the up side and close to the bay platform there were a number of sidings and a goods shed. The station remained largely unaltered until BR days when the station was extensively modernised. 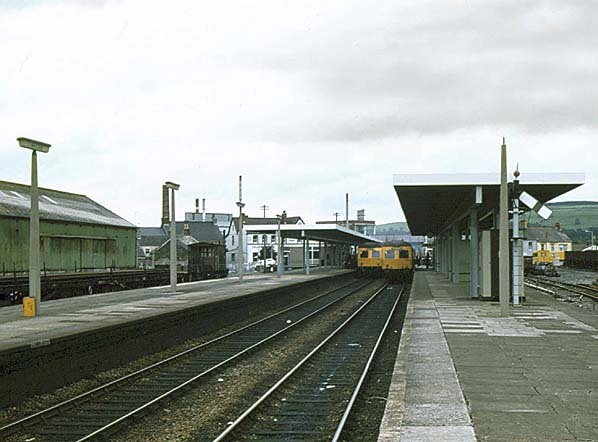 In the 1960s the down loop was converted into a bay for Pembroke Dock trains. The goods yard was on the down side, this was originally built for the P & TR and for exchange of traffic between that company and the GWR before the GWR too over the working of the P & TR . To the south of the station there was an engine shed. The original building was a one-road shed opened by the P & TR in July 1863. The GWR absorbed the P & TR in 1897 and closed Whitland shed in 1901. 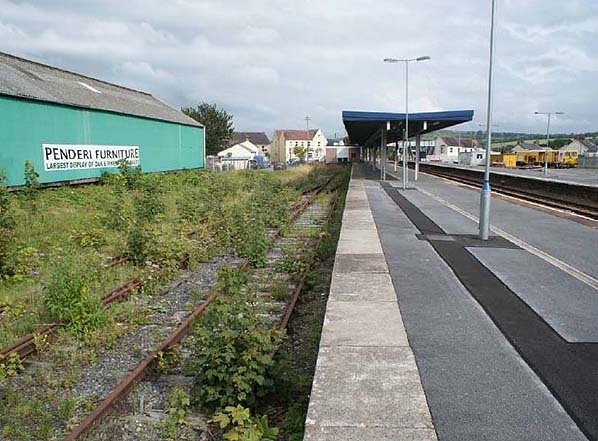 The replacement building was originally the two-road Letterston engine shed of the contractor that built the North Pembrokeshire and Fishguard Railway, opened in 1894. The GWR worked that line and provided a new, one road shed at Letterston, opening 14th March 1895, with the former shed then becoming a carriage shed. But in 1901 Letterston carriage shed was dismantled and moved to Whitland where it took on one road engine shed form; it was later rebuilt by the GWR with a gable roof. Whitland's second shed closed 9th September 1963. Passenger trains from Cardington ran into either the bay or the up main line platform but trains departing for Cardigan usually shared the outer face of the down island platform with P & TR trains. Passenger services are operated by Arriva Trains Wales, using a mixture of Class 158 and Class 175 Diesel Multiple Units. 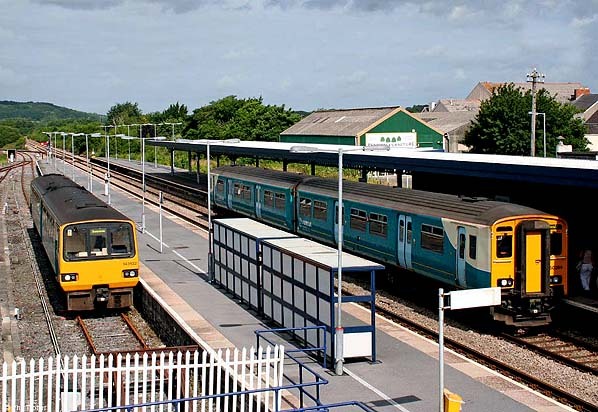 The station has an approximately hourly service (including Sundays) to and from Carmarthen and Swansea eastbound and every two hours westbound to Milford Haven and Pembroke Dock. Certain eastbound services continue onwards to Cardiff Central, Hereford and Manchester Piccadilly. The twice daily service each way to Fishguard Harbour also calls, as do the summer Saturday HST services between London Paddington and Pembroke Dock. passengers, and on 29th May 1875 the Board of Trade was notified that the line would be ready for final inspection two weeks later. An inspector was appointed, but he failed to turn up within the ten day period provided by statute. Having received no communication from the Board of Trade, the line opened to passenger traffic on 12th July 1875 without an inspection. The line was eventually inspected three days later, and the company was informed that it must suspend the passenger service for one month to allow the required modifications to be carried out. The directors ignored this directive, stating that it had acted within the law as the inspector had failed to turn up within the specified period, and that once a line had been opened the Board of Trade had powers only to recommend works and not to compel them. .
their line would probably become part of the GWR. 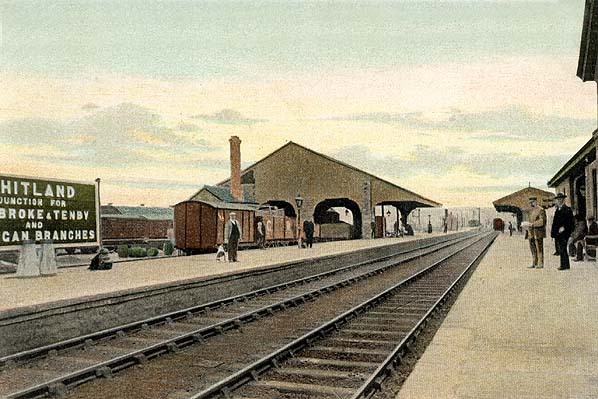 Whitland station looking west along the up main line platform before August 1911. Whitland station looking east along the down main line platform in December 1926. 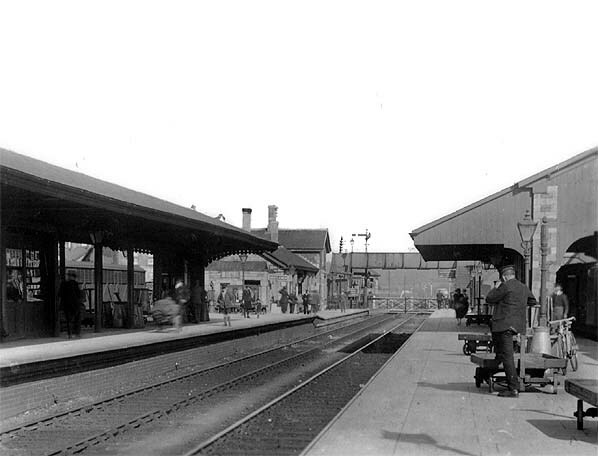 Whitland station looking west along the up main line platform c.1930. GWR 2-6-2T no. 5550 stands at Whitland in the late 1950s, with a train from the Cardigan Branch. 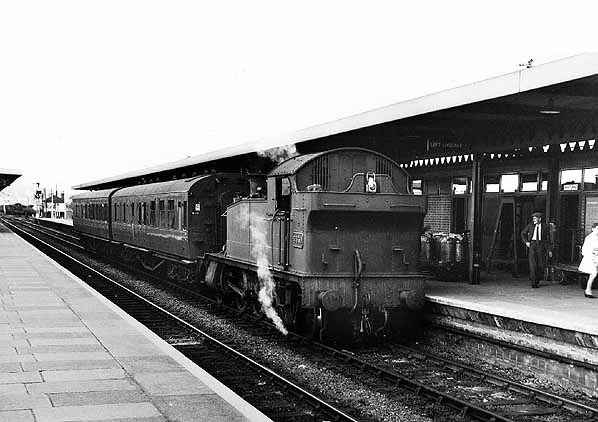 The branch closed to passengers in September 1962 and to freight in May the following year. Note the milk churns on the platform trolley. 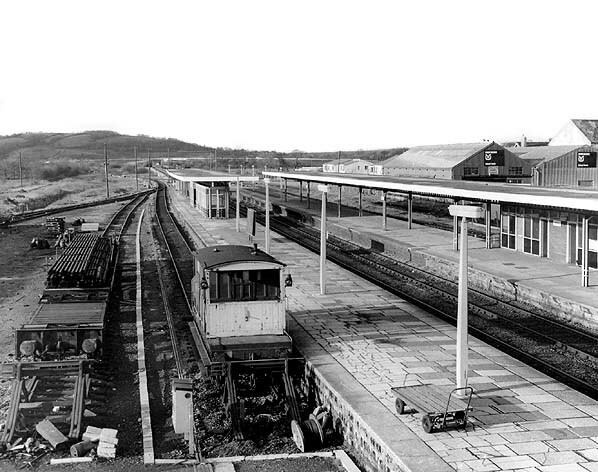 Whitland station looking west in December 1979 with the former down loop on the left. 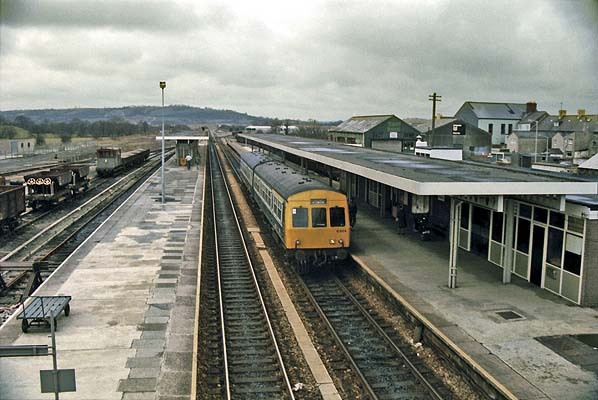 Whitland station looking west in April 1986. Rush hour at Whitland! 143622 (left) has arrived with the 08.35 service from Pembroke Dock while 150264 calls forming the 09.08 Milford Haven to Manchester Piccadilly on 3rd July 2010.